Longworth Street lives only in legend these days. This infamous avenue once ran from Vine Street westward out past Mound Street almost to the Mill Creek. Now, it’s all gone. 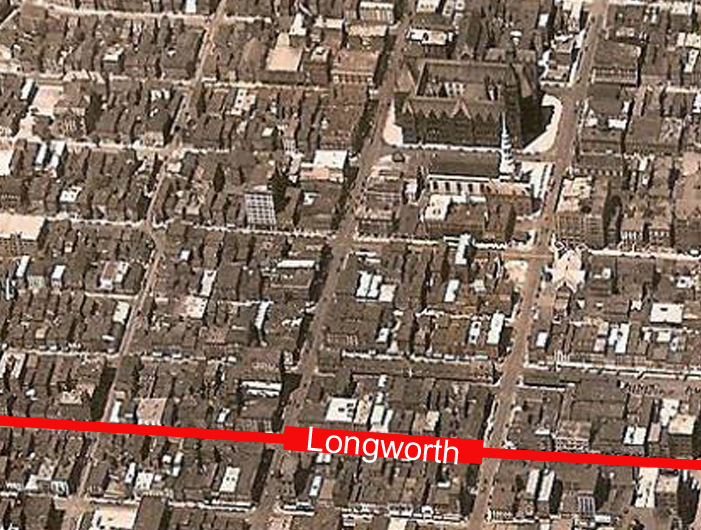 Longworth Street ran parallel to and halfway between Fifth and Sixth Street. Just north of Longworth is the long building that housed the Sixth Street Market. A few squares north lie St. Peter Cathedral and City Hall. Before 1880, houses of prostitution entertained clients everywhere in Cincinnati, from the East End to the far reaches of Over-the-Rhine. Between 1880 and 1917, Cincinnati suppressed houses outside a “segregated district” bounded by Plum, Fifth, Mound and Seventh. Within this district two streets gained particular notoriety, George Street and Longworth Street. On just one block, between Plum and Central, Longworth Street housed 17 brothels, a half-dozen saloons and an illegal gambling parlor. In this map, brothels are shaded pink and saloons are green. Better known as “Joe” Woods, she started out as an “inmate” at another house on Plum Street before opening this “resort” on Longworth. One night, apparently angered by an incident at the Bellevue house, Joe fired several gunshots at her neighbor, Kate Riley, who was unharmed but filed charges. Kate and her sister, May, were two fiery Irish lasses, and they occupied the court docket and police blotter for 20 years, from 1875 to 1894, often for violent attacks by them or on them. Kate owned another brothel at 189 George Street, managed by May. An ongoing feud between the two Kates—Dugan and Riley—kept the police and courts busy and newspaper readers entertained over several years as their “working girls” slugged it out in the parlors of their houses or on the sidewalks. With more than 15 years’ experience as a madam, Adeline Miller owned a couple of brothels. At least one was managed by an adopted daughter. She bought this house on Longworth Street from Kate Riley. Known as “Mother Avery” over her long career, Mollie ran this brothel and also owned the notorious Big Chief saloon on the same block. One day in 1885, Jessie West absconded with the entire contents of her bordello except for a piano, which sat in the otherwise empty house when a constable arrived with a writ to impound the furnishings. In addition to running a brothel, Hattie Wilson was occasionally arrested as a sneak-thief. She had a heart of gold, though. When two young prostitutes drowned in the 1884 flood, Hattie paid their burial expenses. A veritable supermarket of sin, this notorious establishment combined elements of a saloon, a burlesque theater, and a bordello. Its reputation was thoroughly shameful, yet it inspired fond memories among its habitués. Madam Roney ran the sort of place that police checked whenever an upstanding citizen reported a stolen carriage. Investigating officers usually recovered not only the carriage, but the horse, and often a couple or three inebriated felons attempting to induce some frail sisters to ride with them up Spring Grove Avenue. Kittie moved into this house after Nellie Busch, the previous madam, was murdered, stabbed by an unidentified client. Like most madams and prostitutes, Lizzie Manley operated under a pseudonym. Her real name appears to be Elizabeth Burgess. She presided over a succession of houses on Longworth Street for more than a decade. Mrs. Shayne ran this house for several years. Her husband, Jim, was co-owner, but he was never on the premises, preferring to hang out at one of the nearby gambling houses. By 1881, Mary Lippincott was a veteran of almost 20 years in the oldest profession. She opened her first brothel during Civil War when thousands of soldiers passed through Cincinnati, and hosted several others in the years since. Around the time this exposé appeared, Maude Wilson took over Carrie Blake’s brothel at 148 Longworth. A few years later, Maude was in the newspapers because one of her clients shot her. She recovered, but got out of the business. The wife, unfortunately, of a notorious wife beater known as “Dog-Face” Butler, Nettie managed this successful house on Longworth Street before moving to a bigger resort on George Street. Although the Gazette says this house was Gracie Reid’s, all other sources show another madam, Nellie Jackson, as the owner. Perhaps Nellie sublet the place to Gracie for a time. 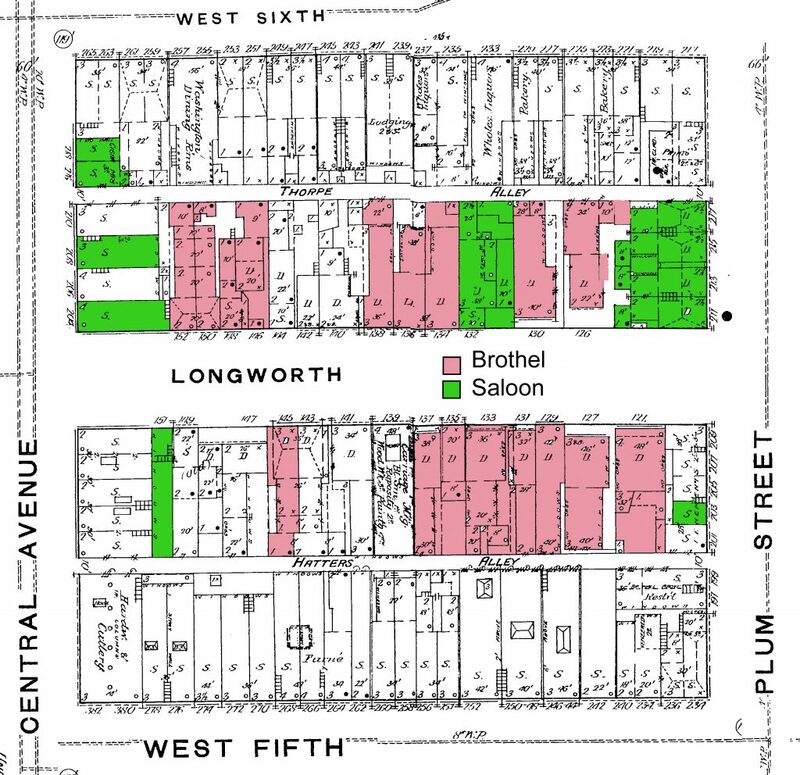 Did anyone occupy a building on Longworth that was not a brothel or a saloon? Indeed. There was a carriage manufacturer smack in the middle of the south side of the block, a couple of rooming houses for men, one seemingly rented exclusively to waiters and one for printers, some dressmakers, at least one gambling den, and a few isolated private residences. By all accounts, saloons and bordellos were pretty noisy places. One wonders how anyone got any sleep on Longworth Street.